Something that Bollywood really excels at is redoing old and popular concepts, whether its sequels or remakes or “reimaginings”. Some of these work, such as Karan Johar’s Agneepath, and some don’t, such as Ram Gopal Verma’s Ram Gopal Verma Ki Aag. Joining the line-up of “new characters, old story” is Karan Johar’s latest directorial credit Student of The Year, starring fresh faces in three principal roles, alongside several old timers. Being a Dharma Productions film, glitzy settings, glamour, everything over-the-top, big dance sequences, flashy sets, etc is all guaranteed from the get go, and the film certainly doesn’t disappoint in that regard, although the script does leave something to be desired. Alia Bhatt (daughter of noted director Mahesh Bhatt), Varun Dhawan (son of noted director David Dhawan, best known for his Govinda-starrer comedies), and Sidharth Malhotra mark their debuts with Student of The Year. Having so many new faces in leading roles is a challenge, but together, these three rise to the occasion and deliver on the promise as they carry the film mostly on the basis of their strong acting. As the privileged son of a multi-millionaire tycoon, Varun Dhawan’s Rohan Nanda oozes angst and repressed anger throughout the film, something that he channels into his friendship with Sidharth’s Abhimanyu Singh, a scholarship kid, and into his music, as he wants nothing more to be a rock star. Of all the three, I found myself liking Dhawan’s acting far more since he was much more intense and came off as much more confident of himself while on the big screen. His is a typical rich boy with parental issues character, but when Dhawan is on the screen, he goes beyond that simple and jaded description. The setting of the film, a high-class high school, and the relative youth of all his fellow actors, makes a big difference in that portrayal. He is no Rancho (played by the stellar Aamir Khan in 3 Idiots, another college rom-com drama), but he definitely holds his own. He is expressive, present in the here and now, and he has a definite flair for acting. Rohan Nanda’s childhood sweetheart and his now-girlfriend, Alia Bhatt’s Shanaya Singhania impresses, mostly because of her comic timing with her fellow debut actors and her cuteness. She isn’t exactly a debut, as she performed in the 1999 release Sangharsh as a child artist, but then, she was only 6 then. I’m not really going to count that brief cameo as much of an acting credit. In Student of The Year she is the rich, ignored daughter of multi-millionaires who is interested only in Rohan and in fashion, and it’s a role that she performs very well. Just like Varun Dhawan, she is quite a decent dancer in addition to being a good actor as well. She doesn’t have Parineeti Chopra’s rough edges (if only!) or Sonakshi Sinha’s heavy voice (good thing! ); relying a lot on her good looks to carry her more sizzling scenes. But still, her acting is on par with that of her half-sister Pooja Bhatt, who is an industry veteran of more than 23 years as both actor and director and producer. She is definitely somebody to watch out for. Rounding off the debut cast, Sidharth’s Abhimanyu Singh is a driven character, who wants success and fame on his own merits. In his first few scenes, he is charming and lightens up the screen when put against Varun Dhawan, but he doesn’t quite carry that through to the end. He is quite a decent actor but I felt that he is also the worse of the trio of principal characters. Don’t get me wrong, he is earnest in his acting and he fits the bill that he is required to, but there was always something off. To add to that, he is not that convincing a dancer (Dhawan being far better in comparison) and my reaction to him is rather lukewarm overall. Still, he shows promise and it will be interesting to see what he does next. In supporting roles are Rishi Kapoor as the dean of St. Teresa’s High School and Ronit Roy as the school coach, as well as a bunch of other young actors rounding off the supporting cast. Sana Saeed, who has worked with Karan Johar before as a child artist in Kuch Kuch Hota Hai, and delivered an excellent performance, has a smaller role this time, but she performs it just as well as Alia Bhatt performs her own. She is the flirty, glamourous rich girl and the role fit her to a T. I wish she had had a bigger role, perhaps even as the lead! Rishi Kapoor’s gay dean was often hilarious but also somewhat cringe-inducing, which is nothing to say on the actor himself, but what he is given to work with. Karan Johar has some kind of a fascination with gay characters in his movies ever since Shah Rukh Khan and Saif Ali Khan made it big with their innuendo-performance in Kal Ho Na Ho along with Abhishek Bacchan and John Abraham’s portrayal of a gay couple in Dostana. The gay side of Rishi Kapoor’s character just seemed so unnecessary, mostly there for the comic value than anything else, which was just too meh. Rishi Kapoor performs great, but his character just wasn’t written so well. 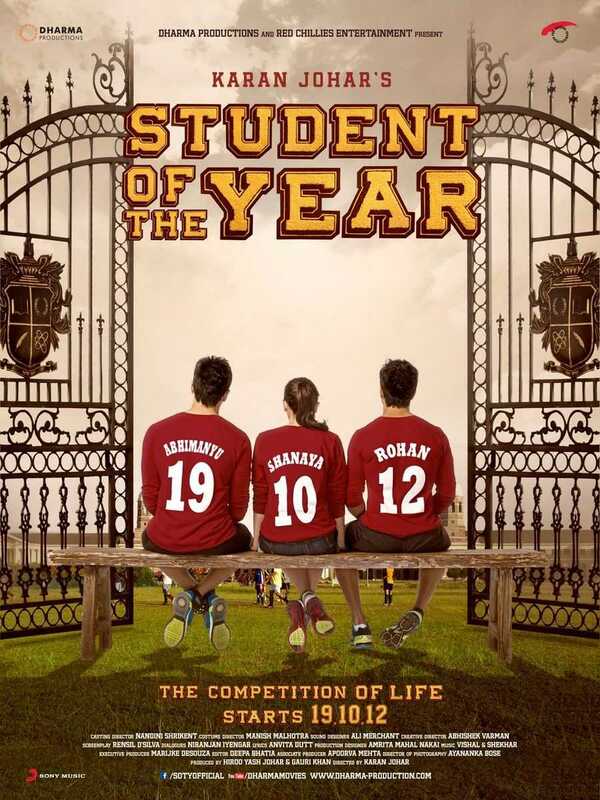 As all Bollywood movies are, Student of The Year is also divided into two clear halves, and it’s the second half that is much more interesting and exciting than the first. The first half is all mostly just character introductions, various medleys of old songs and new, plus the director indulging in showing off the rock-hard abs of his male leads and the bikini-clad curves of his female leads (lumping Sana Saeed here as well). Not entirely unexpected, since this is very much a “youth” film, but it could have been handled a lot better, mostly by being cut in a few places. It was all simply too indulgent and took away from the script which was on shaky ground for that first half. The second half improves considerably as there is much less music for once, and the script focuses on the characters and their trials and conflicts much more. Some real tension-charged energy here that makes the movie a really good one to watch. As my friend, who I saw the film with, remarked, it’s more a bromance film than a high school rom-com, which isn’t bad by any means. Which brings me to the point about the setting of the film. It’s meant to be a film about high school kids, but everything in it screams college kids. High school kids don’t spend tens of thousands on fashion accessories, or drive expensive imported high-end cars, or go to clubs or drink or smoke or go have romance on the beaches of Thailand. Not all of those things at any rate! So just a slight misnomer in that regard. Particularly since this movie is supposed to be a modern Kuch Kuch Hota Hai, which was Karan Johar’s directorial debut. The film isn’t just a rom-com high school drama though. It’s also about friendships and doing the right thing. It’s about coming to terms with who you are and what you want to be. In those terms, it imparts a lesson to all high schoolers and college kids alike: be driven, live happy and have a goal for yourself. The music in the film, provided by composer-duo Vishal-Shekhar and penned by Anvita Dutt Guptan, is excellent. All the songs, especially Vele (Chill Layabouts), Kukkad, and The Disco Song are fast and peppy with great beats that you can sing to all day long. I certainly can. The Disco Song is also a slight medley of sorts as part of it is from Disco Deewane, a hit pop number from the early 80s, sung by deceased singer Nazia Hassan. There are several top-name choreographers on the movie: Cesar, Vaibhavi Merchant, Farah Khan, and Remo, and they all deliver on some really tight choreography that looks tough and easy at the same time. In terms of the choreography, the standout songs are definitely the three I’ve mentioned above. At a guess, I’d say Cesar did Kukkad, and Remo did Vele with Vaibhavi and Farah doing The Disco Song as they are also featured in the song themselves. Overall, I really liked the movie. It offers something new to an old staple but has all the modern glam and dazzle too. I expect any of the three debut actors to go an win an award or two for their efforts, and for the film itself to be a big commercial hit. Posted on February 27, 2014, in Movie Reviews, Review Central and tagged Alia Bhatt, Bollywood, Boman Irani, College, Dharma Productions, Eros Entertainment, Farah Khan, Film Review, Kajol, Movie Review, Ram Kapoor, Review, Review Central, Rishi Kapoor, Ronit Roy, Sana Saeed, Siddharth Malhotra, Vaibhavi Merchant, Varun Dhawan, Youth Movies. Bookmark the permalink. Leave a comment.